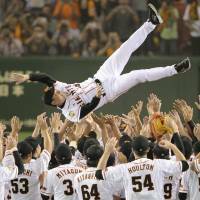 The Yomiuri Giants raced out of the dugout after the final out, as streamers and confetti rained down from the stands, and tossed their manager into the air eight times. So what if the title had been secured a little more than three hours earlier? These moments don’t come around often, and the Giants were going to enjoy it. The Kyojin snared the big prize before their first at-bat of the night, clinching a second straight Central League pennant with a loss by the Hanshin Tigers earlier in the day, but held off on the festivities long enough to beat the Hiroshima Carp 2-1 on Sunday night at Tokyo Dome. The Giants are CL champions for the 44th time in franchise history and can now look toward trying to win a second straight Japan Series title. Yomiuri took the field Sunday knowing a win would secure the pennant no matter what the Tigers did, but any sense of drama dissipated two minutes into their game against the Carp. That was when Tokyo Yakult Swallows reliever Taichi Ishiyama retired Tigers captain Takashi Toritani to close out a 7-6 win in Osaka that officially knocked second-place Hanshin out of pennant contention. Hara has now guided the franchise to six pennants (2002, ’07, ’08, ’09, ’12, and this season) as manager, eclipsing the five won by his former skipper, Shigeo Nagashima. Hara will be looking for his fourth Japan Series title as a manager when the postseason begins in October. Winning the league title gives the Kyojin an automatic one-game advantage in the final stage of the CL Climax Series, with every game also on their home field. The Tigers will likely still finish second and host the first stage of the Climax Series against the third-place team, a spot on which the Carp have the inside track. The winner of that series meets Yomiuri with a trip to the Japan Series on the line. 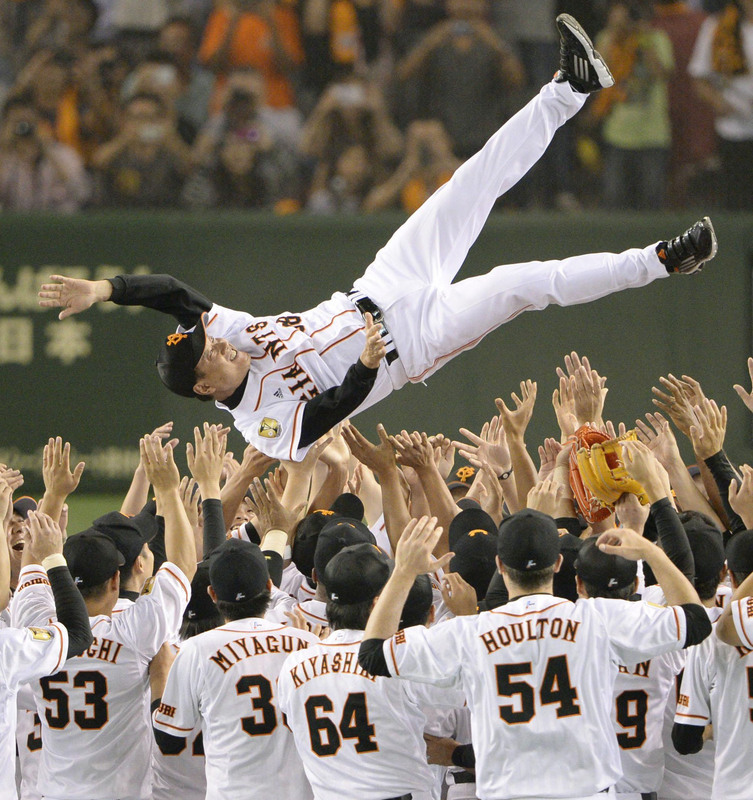 Even though the Giants had already won the pennant, they wanted to celebrate it as winners and needed to beat the Carp to do that. Rookie pitcher Tomoyuki Sugano added to an already solid resume with eight innings of one-run ball. Sugano (13-5) allowed three hits, struck out seven and walked two. Backup catcher Ken Kato, starting in place of banged-up team captain Shinnosuke Abe, drove in the Kyojin’s first run on the night in the second inning, and Hisayoshi Chono had a tiebreaking RBI double in the fourth. Abe entered the game as a pinch hitter in the eighth and caught the ninth, when Hara sent in the relief trio of Tetsuya Yamaguchi, Scott Mathieson and Kentaro Nishimura, the combination he’s leaned on for much of the year, to retire one batter each. “I thought it was important we get Abe into the game and give Yamaguchi, Mathieson and our closer Nishimura a share in the ninth inning,” he said. The Giants are scheduled to wrap up the regular season on Oct. 8 and will begin the second stage of the Climax Series on Oct. 16. Yomiuri will be hoping to get through the long layoff without accumulating the rust that nearly got the team swept out of its first postseason series last year. “We accomplished our first goal of winning the regular season pennant,” Hara said. “We still have to play in the Climax Series and then hope to go on and win our second consecutive Japan Series.